This month's pinny of the month entry has been on my wish list for a while....it has a fabulous country bumpkin style and is from the Betty Boyns collection. I was inspired by so many things after visiting London's 'Spirit of Summer' event; there were ideas for your home, exciting foods, clothes, jewellery... everything you'd expect from a Summer fair really, but there was one stall that I found myself coming back to again and again; the Betty Boyns stall. Based in Cornwall, Betty Boyns has created their own fabric and oil cloth range; and subsequently made pinnys, tea cosies, cushions etc. They've successfully created their very own vintage country style. I love all of the fabric designs, and their products are a must have for any home; in the country or not. 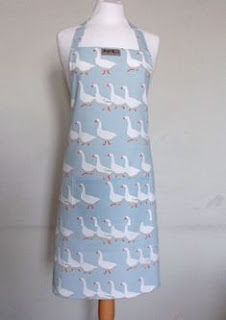 My favourite (I think...it changes quite frequently) of their pinny's, is the Red Cowslip Pinny, and at only £15 I think everyone should click the link and purchase it today! I really like to support small family run businesses, the products are so much more personal, and those little touches make all the difference. But the real reason this company won me over was the fact that you can buy the fabric on it's own! I always get frustrated when I see a product which I like, but would want to change slightly, or do something a little different. Usually I find myself unpicking a finish product to try and adapt it to how I like it, and pay full price for the pleasure. Not with Betty Boyns; you can walk away with the fabric of your choice and inspired to create whatever you fancy. 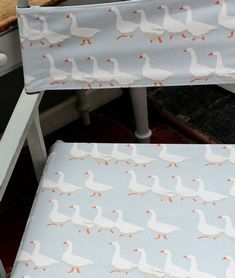 Naturally I came away with a couple of meters of their duck/goose print cotton. How could I resist???? Now to decide what to make with it.... any suggestions?